^ A Brief History of Mars Missions | Mars Exploration. Space.com. [2016-03-04]. ^ Salisbury, Frank B. Martian Biology. Science, New Series. April 6, 1962, 136 (3510): 17–26. Bibcode:1962Sci...136...17S. PMID 17779780. doi:10.1126/science.136.3510.17. ^ NASA (NSSDC) Master Catalog Display Mars 3. [2007-03-28]. ^ NASA (NSSDC) Master Catalog Display Mars 4. [2007-03-28]. ^ Bianciardi, Giorgio; Miller, Joseph D.; Straat, Patricia Ann; Levin, Gilbert V. Complexity Analysis of the Viking Labeled Release Experiments. IJASS. March 2012, 13 (1): 14–26 [15 April 2012]. （原始内容存档于2012年4月15日）. ^ Klotz, Irene. Mars Viking Robots 'Found Life'. DiscoveryNews. 12 April 2012 [16 April 2012]. ^ Matthews, Mildred S. Mars. University of Arizona Press. 1 October 1992 [14 August 2012]. ISBN 978-0-8165-1257-7. 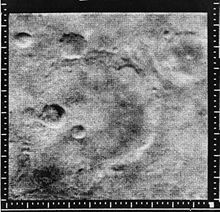 ^ Raeburn, P. (1998) "Uncovering the Secrets of the Red Planet Mars". National Geographic Society. Washington D.C. ISBN 978-0-7922-7373-8. ^ Moore, Patrick; Hunt, Garry. The Atlas of the Solar System. Chancellor Press. 1 January 1997 [14 August 2012]. ISBN 978-0-7537-0014-3. ^ December 4, 1996 – First successful Mars Rover – Sojourner – was launched. Todayinspacehistory.wordpress.com (2007-12-04). Retrieved on 2012-08-14. 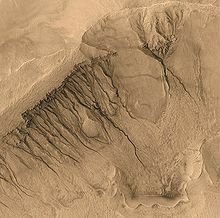 ^ Rayl, A. J. S. Phoenix Scientists Confirm Water-Ice on Mars. The Planetary Society web site. Planetary Society. 2008-06-21 [2008-06-23]. ^ Mars Science Laboratory Launch. 26 November 2011 [2011-11-26]. ^ Associated Press. NASA Launches Super-Size Rover to Mars: 'Go, Go!'. New York Times. 26 November 2011 [2011-11-26]. 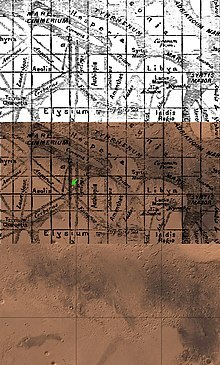 ^ MSL Sol 3 Update. NASA Television. August 8, 2012 [2012年8月9日]. ^ MSNBC Staff. Video from rover looks down on Mars during landing. MSNBC. August 6, 2012 [October 7, 2012]. ^ Young, Monica. Watch Curiosity Descend onto Mars. SkyandTelescope.com. August 7, 2012 [October 7, 2012]. （原始内容存档于2012年12月9日）. ^ "Phobos-Grunt: Failed Russian Mars Probe Falls to Earth". ABC News, January 15, 2012. ^ "Phobos-Grunt: Failed probe likely to return late Sunday". BBC News (2012-01-15). ^ Morris Jones (2011-11-17). "Yinghuo Was Worth It". Space Daily. Retrieved 19 November 2011. ^ India’s Mars Mission Mangalyaan to be launched on November 5. [22 October 2013]. ^ India to launch Mars Orbiter Mission: PM. deccanchronicle.com. [13 October 2012]. ^ India Mars Orbiter Entered Mars Orbit. [25 September 2014].